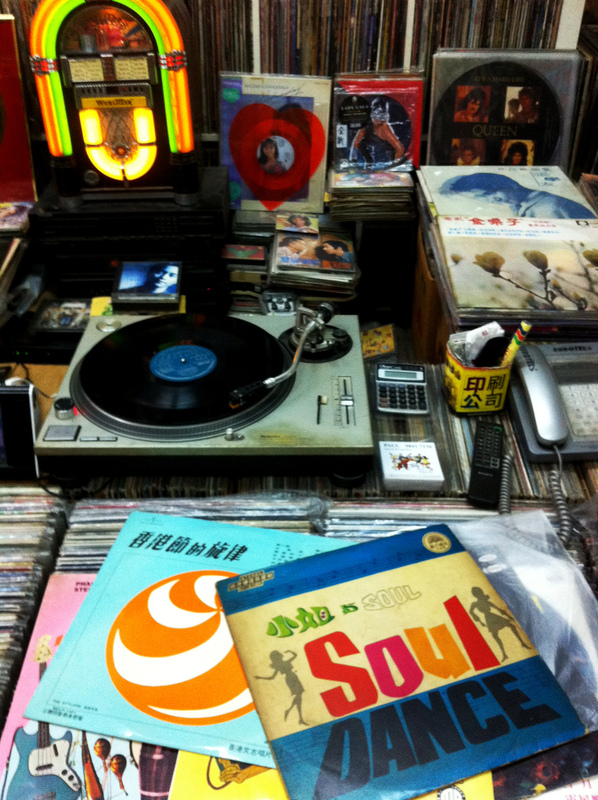 On Record Shopping in Hong Kong | This Japanese Life. Posted on January 3, 2012	by E.
The streets are covered in computer parts and curious Chinese lozenges. It’s 2 p.m. in Sham Shui Po, Hong Kong. A man in a Mister Softee truck peddles soft serve beneath a landscape of dilapidated buildings, fluttering linens and neon signs poised to flicker to life at sunset. I duck into an apartment building, take an elevator to the fifth floor to a door with Chinese characters scribbled in Sharpie, and I knock. “Just a minute,” I hear. Five pass before Paul Au Tak-shing opens the door without any pants on. He welcomes us in and I have to crab walk past the walls of vinyl bursting out of Tsing Tao boxes. Paul’s apartment could barely be called an apartment. He’s sleeping in a warehouse. I’m standing in the only exposed floor space, about 6-by-3 feet, where Paul lays out a sleeping bag at night, cradled by 30,000 records. I’m looking for something with beats, I tell him. Funk, reggae, preferably older and preferably local. I can feel the hipster dribbling down my legs. Paul doesn’t judge me. He nods, hands me a folding chair and scurries barefoot over a pile of records into a back room, coming back with a stack of six 12-inch LPs. “I’ll let you listen,” he said, crawling over a four-foot stack of ‘80s new wave to the record player in the center of the room. He sprays water on the record, wipes it down with a cloth and drops the needle on a single electro-reggae track from an ’80s Chinese cop-comedy soundtrack album. It’s perfect. Hong Kong is a modern city, and went through the same tech shifts as the rest of the world: Sony introduced the Walkman in 1979, and within two years, cassette tapes – a portable and re-recordable alternative to vinyl – made records obsolete. And so everyone started throwing records away. “They were homeless,” Paul said. So, he gave them a home. He’d wander around looking for the crates of records in the street or discounted in record shops, then pull them into a small market stand he was renting. No one was buying them, but it meant the records had a place to live. And so did he. Market stalls line the in-between alleys of Hong Kong, selling everything from fruit to towels to red-and-gold dragon kitsch. Paul slept in his market stall, surrounded by the records he’d rescued for about 20 years. Imagine spending your 20’s looking for VCR tapes. It sounds crazy. But for 20 years, that was Paul’s career. In some ways, it still is, except now everyone wants their stuff back. 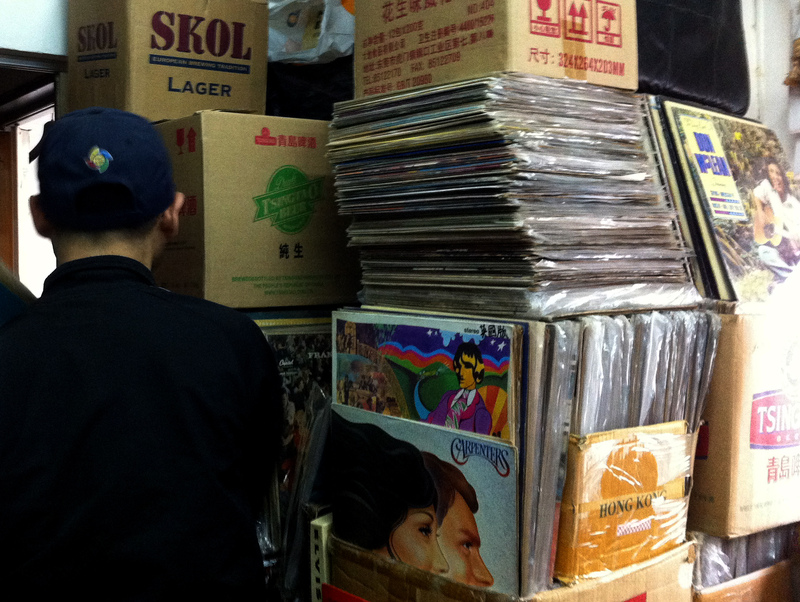 Without Paul and a handful of people like him, the entire musical history of Hong Kong’s vinyl era might have disappeared. There’s a picture of Paul back then, framed on a shelf above an ABBA record. He’s sitting on a Harley-Davidson motorcycle, curly black hair flowing out of a bandanna. The hair’s gone these days, and so is the bike. He sold it to pay for the apartment, because he had too many records to fit in a street stall. “I’m on my way to getting [the bike] back,” he told me. Vinyl’s appeal has returned, and now the same tide that made Paul look a little nuts in the ‘80s make him look a little shrewder than he probably is. Cassettes died and CDs ascended, only to suffer a coup by the MP3. And yet, vinyl sells. Records are a ritual: Sliding it out of a sleeve, dropping a crackling needle into the groove – it’s linked to some primal cultural-genetic pleasure center in the brain. It’s satisfying to music fans the way chasing a car is satisfying to dogs. CDs and cassettes, with their inelegant and creaky plastic cases and minuscule album art – don’t scratch the same itch. Give me a gate-fold sleeve and two hands to hold my music. Some of us prefer a ritual to a phone. 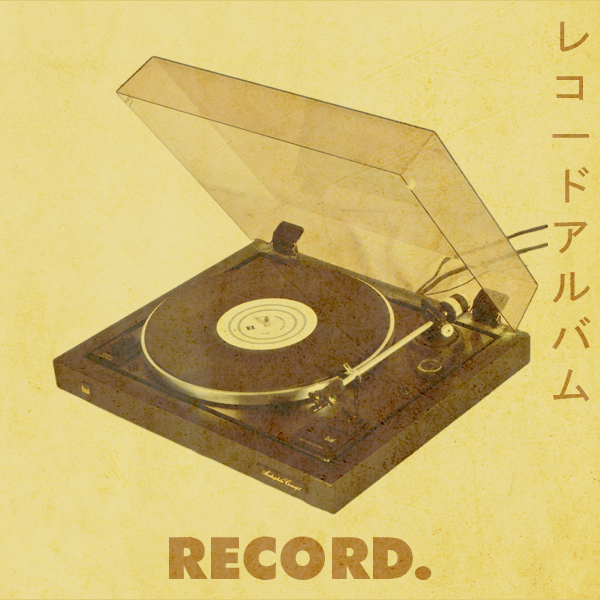 But most importantly, records are the only archive of an entire period of musical history. And in this corner of the globe there’s not a lot of urgency to preserving that culture. I love it. But it’s a little cringe-worthy to the kinds of people who just wish China would get on to making Western Pop. And the purists who want to respect the native culture aren’t interested in the kinds of fusion that this period produced. So you have real creative energy fueled by the collision of east and west, making all kinds of weird and lovely contextual crashes that otherwise would be crushed in the trash compactors of Hong Kong. I found Paul on the Internet. He said he doesn’t use it. Maybe that’s no surprise. But he mentioned that a friend had put up a link to the store on Facebook, and now he gets calls from all over the world. That said, I couldn’t find him on Facebook. There’s no website, no e-mail account, no PayPal. You just call him up (In Hong Kong, 9841-7136) and ask what time he’ll be around. After three hours of hanging out, Paul had given me a decade-by-decade summary of the last 50 years of Asian rock and pop music, playing examples from ‘80s Cantonese Reggae to ‘60s garage bands. He’d also put on a pair of pants. I grabbed three records: a ‘60s girl group from Singapore as a gift for Japanese Sleeves, and two records of funk-influenced Chinese instrumentals. Cost me about 18 bucks and Paul threw a record in for free. Hong Kong Pop is a wider survey of the genre, including more modern stuff, while Japanese Sleeves is strictly covers and recordings of obscure vinyl found in the discount bins of Japanese record stores. You can willfully dedicate yourself to obscurity by liking This Japanese Life on Facebook. This entry was posted in Music, Travel, Uncategorized and tagged hong kong, music, record stores, records. Bookmark the permalink. good stuff man. this will definitely help next time I’m in HK. thanks a bunch!